We constantly change the world, even by our inaction. Therefore, let us change it responsibly. Them: "What do you do?" Me: “I am Sherri. I am The Practical Sort. As a home organizer, I provide practical solutions for busy women who are frustrated and overwhelmed by disorder in their homes. They want walk into rooms feeling “wow” instead of screaming “wah.” I can help them find the wow factor, be more productive, comfortable and content in their living spaces". So what is your reason to be organized, if you aspire to be? Someone told you that you that your life is a mess? It’s trendy? Face it, if you don’t truly want it or buy into it, it is never likely to happen. Last year, I wrote an article for Oregon Jewish Life Magazine examining organizing misconceptions. These are the things inhibiting and sabotaging our desire for change. After meeting several women this past weekend who shared their stories with me about their motivational challenges, I thought it might be time to resurrect the topic. We’re all pressed for time. And when there is time to spare, you likely prefer to have fun instead of managing papers, toys, and clothes piles. Yet disorganization has costs to your wallet and time management bank. These types of scenarios sound familiar? Do they cause your shoulders to tense and pulse to quicken? Get your surroundings under control and the dividends will rapidly accumulate. Keep a rag close by to wipe counters as you cook. Then clean up is a breeze. Set up "ACTION" bins for each child's paperwork needing your attention. Before dessert, ensure that all backpack items have been appropriately sorted into the bins. Create an Accordion file for tax-related receipts. Drop the receipts in as you receive them. Financial tracking software will also speed up your tax filing process. You will be on your A-game when tax time comes. 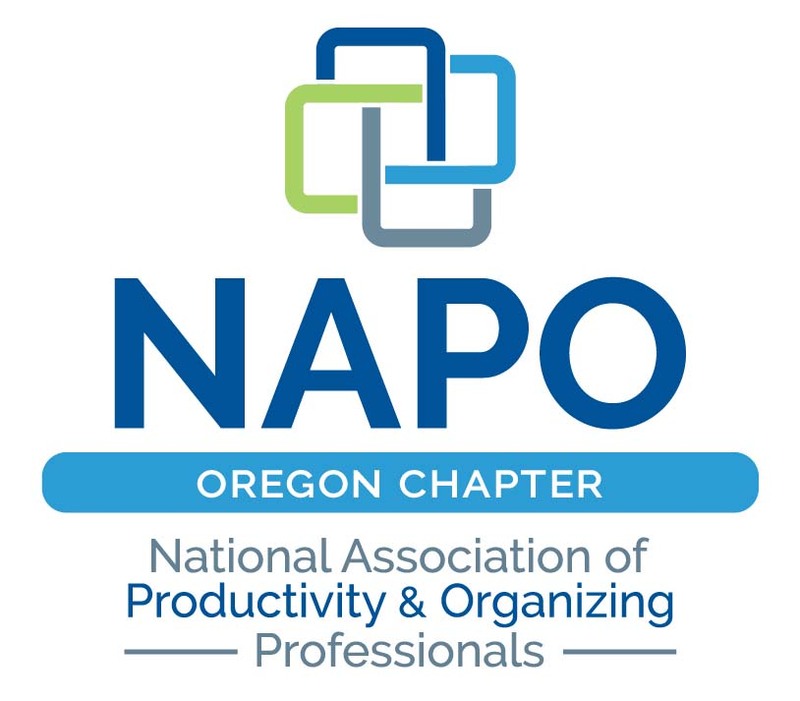 You can find lots of other tips to enhance your productivity by clicking here. Organization frees up time. Leaving the house is less challenging when your keys are on the peg by the door; those permission slips are signed and nestled in the backpacks; and receipts are filed ready for tax time. Unrealistic expectations can cause immense stress and action paralysis. There is no need to keep your home perpetually camera-ready. Ask yourself, am I at peace in my home? Can I easily find what I need? Can I accomplish tasks at a reasonable pace? If you answered yes to these questions, chances are you’re golden. Surrender the perfectionism to magazine covers. Not a Pinterest Queen or King? No problem, simplicity is the key to getting started. Leave the crafty storage bins and labels to those who have the time, talent and inclination. A myriad of books, magazine articles, blogs, and videos are filled with tips and guides to achieving organization. Why are there so many resources? Because there are an infinite number of methods and perspectives. Explore your unique style. Pay attention to daily routines over a week or more. What flows smoothly? What causes hitches? Relocate items to save steps and time. As there is no correct way to arrange your possessions, you cannot do it wrong. Following someone else’s prescription may or may not work for you. For a system to be sustainable, it must suit the users. 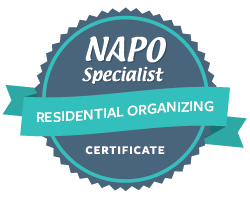 If you are struggling to find your way, professional organizers are available to guide you. There is no failure and no one is judging you. Organizing is an experiment. After you rearrange, give it a go for a few days or weeks. Not satisfied? Return to the drawing board, assess the hiccup, and change things up again. Nothing is set in stone. Let’s say your dishes reside in a cupboard near your dining table. While setting the table is a snap, you cart heavy stacks across the kitchen after unloading the dishwasher. This process is unwieldy, bad for your back, and time consuming. Is there a cabinet above the dishwasher? House the dishes there. The result is a few extra steps at dinnertime, and unloading the dishwasher goes faster with less strain on your back. Refrain from beelining to the Container Store. What you need to get organized is minimal. Search basements and attics for container options. A thorough clean out frees up containers and spaces for repurposing. Voila you saved money and time by avoiding a trip to the store. An occasional purchase might be needed for file folders, labels, shelves or a shredder to get up to speed. The goal is to rid yourself of excess stuff not buy more. A popular organizing book series purports that the entire organization project must be done all at once. That works for people living in small spaces with few possessions. The author’s advice would send a number of my clients into a frenzy. Baby steps will ease you into the process, so start small and see how it feels. Tackle one area or room for a rapid sense of gratification. Your success will invigorate your self-confidence and eagerness to take on the next space. No space to store what you have typically indicates that it is time for a heart to heart with your possessions. Think twice before buying new stuff. Could you borrow or rent it if it will only be used once or twice. Would you be willing to get rid of something to make room for something new? Would you actually pay a mover to move it? Consider the market value of the square footage of your home. Has each of your possessions earned the right to occupy “x” amount of space based on that value? On occasion we become custodians of others belongings. Independent children move back home. Seniors transition into assisted living and we temporarily house their furniture. Life throws us curve balls. If the situation is temporary, you might have to make do. For the long term, carefully consider clearing what you can. If the furniture belongs to your children, assess the quality. By the time they move out again, they will be ready for something better than milk crates. Farm out some of your parent’s possessions to siblings, if possible. If there is no chance that your parents will return home, pass along their things for consignment or donation for others to appreciate. Some people might view each of the 8 points as excuses. I prefer to think of them as misconceptions and now that we have laid them to rest, it is time to take some action to get the "wow" factor back into your home. In working with my clients, I love watching their ah ha moments as they discover organized spaces need to be realistic and are within their reach. When they are jumping up and down on the driveway (yes this has actually happened), I know that not only have I done my job, I know they finally get it. Think you could use an extra hand getting your project started or completed? Contact ThePracticalSort.com by clicking the button below and we will get you sorted.